Traditionally, thirty has been known as a sort of an early over-the-hill, beauty wise. No more! Whether you’re twenty four or forty, you can have beautiful, healthy, radiant skin. Here’s our quick and dirty guide to gorgeous skin at thirty. We’re not talking weight here—we’re talking about your skin. One of the first things women notice when they cross that magical line from their twenties into their thirties is that their skin isn’t as taut. What’s that about? Well, one of the primary reasons for loosening skin is a lack of collagen. Collagen production starts to wane in our mid twenties (so feel free to start following this advice sooner!) but becomes particularly noticeable in our thirties. Take note of the back of your hands and the skin along your jaw and you’ll notice a lack of healthy padding. That’s from collagen production slowing down. The good news? You don’t have to accept it. With ingestible collagen products, and topical products that encourage collagen production, you can fight back against this sign of aging. IMAGE Skincare’s YANA Daily Collagen Shots boost natural collagen production from the inside out using the latest anti-aging technology. It’s no secret that the sun is one of your skin’s greatest enemies. But plenty of people think that protecting their skin from the sun just means slathering on sunscreen at the beach. Maybe that was enough when you were sixteen, but if you’re pushing thirty it’s time to take sun safety more seriously! You should be fighting UV rays every day—not just on a warm August afternoon. If the thought makes you shake your head because you’re imagining unappealing, skin-drying sunscreen, think again! IMAGE Skincare has an ultra-sheer light weight moisturizer with an SPF 50 rating. The PREVENTION+ line fights aging by preventing environmental damage. Having beautiful skin isn’t the only reason you’ll want to eat healthier in your thirties but it’s another great motivator. Probiotics, excellent hydration and making sure you eat plenty of whole, healthy foods can work wonders for your skin. And vitamins aren’t just good for your skin when you eat them. 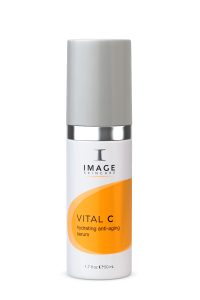 IMAGE Skincare’s VITAL C hydrating anti-aging serum nourishes your skin with vitamins C, A and E for healthier, younger-looking glow. Thirty isn’t the time to hang up the towel. In fact, beauty in your thirties is all about taking better care of yourself. Enjoy the pampering!